Now, I know this is a pretty random thing to talk about, but as it’s part of this whole adventure we’re on, I thought I should give it a mention. Whilst doing what we’re doing, as you can imagine, we come across quite a spectrum of smelly things, but the smell that has really surprised me the most is definately up at the top of that list. 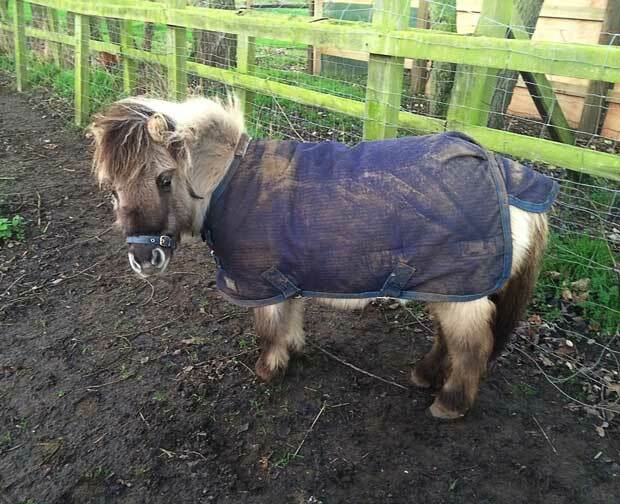 I think the smelly award should go to Maisie and Lucy the shetland ponies! It’s not what your thinking though, it’s actually their feet. I would never have thought that cleaning out the ponies feet, as we have to regularly, would be such a horrendously whiffy job! By heck do they hum! Talking of the ponies, this week they have been at the centre of a bit of going on, but this time it’s totally unrelated to their feet thankfully. I know they are a hardy breed and have an extremely thick coat, but I was talked into getting them each a coat, for the winter. So, we went out shopping for coats. I was surprised that they weren’t too expensive and we were able to get them both coats to match, very swish! We hurried home, gave them both a good groom and decided to let Lucy try her coat on first. You see she hates anyone going near her back end and so it was going to be quite a challenge to get her new coat on, or so we thought! In fact it went like a dream, without any hiccups at all. It fitted really well and she looked a right bobby dazzler too, but that’s when things got all interesting. Although we thought Lucy looked great, her mother, Maisie, clearly didn’t like Lucy’s new look at all. Maisie began running round and around the enclosure swiftly being chased by Lucy. Each time Lucy went near her, she would just gallop away, without hesitation. It was as though Maisie didn’t recognise her own daughter. This continued all afternoon, but as dusk fell, it was time for them to go into their stable, and somehow I had to get them both into the same stable, but without Maisie having a right old strop! Even though there were a few moans and a fair bit of chasing, I managed to get them both in for the night. I stood outside for a time, just listening, hoping that there wasn’t going to be any kicking off as I walked away and things would just settle down. In fact that’s what did happen and luckily they were back to being the best of friends again in the morning. The thing is, we could see whilst trying Lucy’s coat on that Maisie needed a larger size, which is now on order and so we may experience a similar drama, when we attempt to put Maisie’s coat on too. Just an update from last weeks duck tale. Fleur, our remaining lonesome Muscovy duck is bearing up well after the loss of her siblings. We continued each evening to round her up into the barn, but after a couple more days of us chasing, she decided to make her own way in as dusk fell each day. That arrangement has subsequently changed again, I’m not sure why, but it looks like she wanted some company and she has decided to move in with Queenie and Rita in one of the hen houses. She has made herself a wonderful nest and looks right at home in there. How long that little set up will last is anyone’s guess!